The demand is high for lakeside homes on Rangeley Lake and Mooseloomeguntic Lake. You’ve just spent a lovely vacation in the Rangeley Lakes Region. The idea of living in a place with no traffic lights and no fast food chains appeals to you. You enjoy the town’s quaint New England lakeside village feel. Maybe the somewhat quirky sign in the Town of Rangeley boasting that it is halfway between the Equator and the North Pole appeals to your sense of humor. You start imagining what it would be like to actually live there. 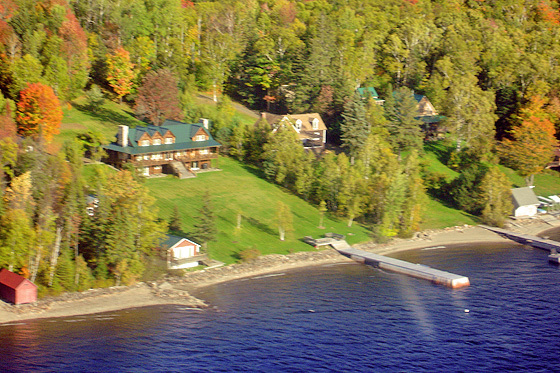 Or perhaps you’d like your own Rangeley vacation home, a special retreat surrounded by nature that exudes relaxation. Finding your own slice of Heaven in this land of stunningly blue lakes and trees that welcome fall with colorful enthusiasm may be easier than you think. When you relocate to the Rangeley Lakes Region you have a number of locations to choose from. If you prefer the New England village lifestyle with creature comforts, entertainment and shopping at your doorstep you might want to consider the Town of Rangeley, the largest population center in the area. As of 2011 the town itself had 1,104 residents, with a five percent increase in population over the last ten years. Smaller villages such as Oquossoc, Madrid and Wilson’s Mills offer a more rural lifestyle but are still an easy drive from Rangeley. Perhaps you are looking for that out of the way retreat on the shores of a quiet lake. Another consideration is why you are interested in buying property in Rangeley. Are you retiring, looking for a vacation or second home? Do you need a moving company such as Mayflower movers to relocate your belongings to Maine? Perhaps a timeshare property would suit your lifestyle, or maybe a rustic sporting camp. Then again, you may be looking for some commercial space to start up a dear-to-your-heart business venture. Currently there are eight real estate agencies that know the Rangeley Lakes Region intimately and would be happy to help you find the perfect property. The average listing price of a home in Rangeley, as of this writing, is just over $449,000. Your actual price will depend on how large the home is, where it is located and what type of view it has. For example, looking at current listings, if you were thinking of opening a B&B or simply wanted plenty of living space, an eight-bedroom property on nearly 100 acres in the village of Madrid would run you nearly $800,000. A three-bedroom condo in the heart of Rangeley town close to the water can be had for less than $200,000. A one bedroom cabin on Haley Pond might be available for just over $100,000. There are a number of condos available in the Saddleback and Rangeley Lake areas. Also in the area are vintage properties, New England style clapboard cottages and a number of log cabins, some of them of the rustic variety. The Rangeley Lake Resort offers upscale cabins as timeshares, including a private clubhouse, private beach and dock on Rangeley Lake. Timeshares allow you to buy a specific amount of time in a property. You are guaranteed that time slot for a vacation stay every year. You may also opt to buy a piece of land and build your own home, perhaps even a log cabin. One dealer in Rangeley sells the makings for log cabin homes and there are several builders in the area that specialize in these types of properties. Talk to a Realtor before buying real estate in the area so you get access to the best locations available. Contractors and sub-contractors are also available to do all types of home construction and renovation. Property tax rates in the Rangeley Lakes Region vary according to where you are living. The area is divided into several tax regions, including the Town of Rangeley, Rangeley Plantation, Sandy River Plantation, Dallas Plantation, Lincoln Plantation and Coplin Plantation. As an example, the tax rate in the Town of Rangeley is currently $12.49 per thousand of assessed home value. The town of Rangeley offers the stunning beauty of a lakeside village combined with the conveniences of modern life. The Stephen A. Bean Municipal Airport is just north of town and Rangeley Lake itself is home to Acadian Seaplanes, a float plane company offering air taxi service and air tours. Restaurants and shops abound, offering home furnishings and accessories, local arts and crafts, clothing, footwear and a healthy supply of books. Hardware, building supply and appliance stores also carry items to make your home comfortable. The Rangeley IGA, the Oquossoc Grocery and a number of convenience stores offer foodstuffs. Sporting goods shops and dealers carry an assortment of boats, canoes, kayaks, ATVs and snowmobiles. A movie theater and bowling alley are also in Rangeley town. Also in town are two banks, one dentist office, the Rangeley Health and Rehabilitation Center, the Rangeley Public Library, Rangeley Police Department and the Rangeley Fire Department. Additional fire services are available from the Oquossoc Volunteer Fire Department. In nearby Farmington and Rumford are two hospitals. Seven churches are in the area, four in Rangeley, two in Oquossoc, and one in Madrid. Various community organizations include the Rangeley Friends of the Library, Rangeley Friends of the Arts and the Rangeley Lakes Heritage Trust. The latter helps to preserve the rural nature of Rangeley by making sure the area does not become overbuilt. Rangeley’s reputation as a year-round recreation hotspot insures you will never be without a way to enjoy the great outdoors. Take advantage of the four marinas, two in Rangeley and two in neighboring Oquossoc. Lakeside Park in Rangeley has its own beach with lifeguards in the summer time. Rangeley State Park and Oquossoc Park, in the village of the same name, are also available. The Evergreen Golf Club and Mingo Springs Golf Course are in Rangeley town. The Rangeley Lakes Trails Center, featuring cross-country skiing and mountain biking venues, and Saddleback Mountain Ski Area are nearby. Please see our website for even more information on recreational opportunities as well as anything else you’d like to know about the Rangeley Lakes Region. We have information and listings on specific services, shops and area attractions. Find virtually everything you need to know about making Rangeley, Maine your perfect New England home.